I like this as another way of expressing the maxim of the best telescope / binoculars being the one used the most. Part of me would love an 8"-10" for more planetary resolution, but I'm not willing to tote anything > 40 pounds, which limits me to either a.) building my own or b.) forking over ~2k, and I'm not ready for that yet. A 10 inch Dob consists of two easily moved, easily assembled pieces that weigh about 30 lbs each. For me, it's not just the weight (although that's a big factor), but also the hassle and heft. I can cart out my 5", OTA and mount, at 14 pounds in one trip. With a pair of binos on my shoulder and a plastic bag for my sketching journal and assorted paraphernalia, it's very easy to get out and start observing immediately. I don't even notice a cooldown time. On the other hand, making two trips with a 30 pound water heater and a 30 pound milk crate is enough to keep me indoors. It's possible this will change someday, but given that when I had an S&T subscription in high school many years ago, I was most attracted to the TV-85, ETX-90, and Astroscan-type telescopes and now, with a house and yard of my own, I chose to buy a 130mm tabletop dob, it's unlikely that I'm ever going to tolerate a heavy, bulky ticket to the stars. Now large aperture in a lightweight and suitcase-compressible package? That's a direction I could venture in someday. Edited by Binosaurus, 04 July 2017 - 12:41 PM. If you haven't owned a larger aperture scope, then you might find that that the better views views more than offset the added hassle. One look at Saturn or M13 might change your perspective. Cool down is an issue in a One Sky just as it is in a larger scope.. it just means one has to wait for the scope to provide it's best possible views.. It's possible, but I doubt it. More aperture will always lead to an overall better view, but everyone hits their stopping point, whether due to contentment (ideally), or due to financial or physical or psychic limitations. With telescopes, I prefer small, light, and simple. Always have. I've looked through larger scopes, and after the Oohs and Aahs, I've always been happy at the thought of not having to care for them. And regarding cool down, I mean that I'm typically satisfied with the view from the minute I start observing; if it gets better, that's great, but simply having a clear night (and not being bitten by mosquitos) is a victory for me. We all have our own situations and limitations. I prefer having choices. Small, light and simple is good but so is larger, not so light and simple. For me, that would be my 10 inch Dob.. I'm not sure what you mean by not having to care for them, other than the increased hassle of moving the scope, a 10 Dob requires about the same level of effort as a 5 inch mini-Dob. For me, the primary advantage of larger scopes is not the Oohs and Ahhs but rather just the fact that I see more. But, we all have different resources and abilities.. I was about to loan my 10 inch to a friend but he just could not lift the tube. Indeed! My ideal setup is one telescope and one pair of binoculars. Currently that's the 130mm and a pair of 12x42s. With a willingness to spend more, I'd perhaps go with a 10"-12" ultralight f/4 or f/5 and a pair of 15x56s or 18x50 ISs. For now, I'm far more limited by ambient conditions than by anything else. For some it's not a matter of effort but of storage space. I can get about 4 tripods and a 5" OTA into the same space it takes to store my 10" dob. Seeing more is also subject to quality as much as aperture. A poorly figured 1/2 wave (as many commercially made mirrors are) 10" mirror is NOT going to show more than a finely figured .95 strehl 5" APO! Add to this errors in collimation and the gap may widen. A couple of issues with this comparison. A 10" Dob has a fairly small footprint (20" circle, 4.5 feet tall.) The CG-4 tripod/mount for my 110ED takes up a lot more space. Poorly figured 10" mirrors don't appear to be the norm anymore, so the "many" is a real stretch. A commercial 5" apo with a suitable mount will likely cost three or more times as much as a 10" Dob. A "finely figured" apo will cost much more. The 10" commercial mirror will show far more, even discounting for overall system transmission differences, etc. There are specific things that a good 5" apo should be able to do better with respect to contrast and such, but when it comes to fine details, visibility of tens of thousands of faint fuzzies, etc. the 10" wins hands down. The 10" is definitely the "show more" scope. With respect to collimation...easily done with a Newt, good luck if the collimation gets knocked out in a triplet refractor. Edited by Redbetter, 05 July 2017 - 02:25 PM. Depends what you mean by "show" I guess. It appears some just mean image brightness. If you want to see a real big fuzzy ball when you look at Jupiter then don't worry about mirror figure (I guess). BTW, I don't use EP trays so I can fold my tripods up when not in use. Take up very little space that way. I agree about collimation being easy, but it seems many do not if you read the forums much. Even a poorly collimated 1/2 wave 10" would show far more than a fuzzy ball for Jupiter. Other than a truly awful astigmatic Meade 4.5" Newt decades ago the poorest images I have seen have been from indifferently made 70 and 80mm fast achro doublets which do not have sharp focus, and even they reveal more than a fuzzy ball. Honestly, I don't see descriptions with 5" apo's that can match what a Z10 does in the "meh" seeing we typically have locally. Instead I hear things like the 4 to 5" refractors fail to show the white ovals in the STB for most observers. I can just barely detect one or at most two of them in the 110ED next to the Z10 when the latter is revealing four in a string. An 8" SCT is better than the 110ED in these conditions, despite the cats' softer appearing image. And when it comes to revealing fainter moons the 5" is going to be badly outgunned. The difference in DSO's comes down to image brightness/scale and how much deeper the 10" will go. While I don't have a premium 5" apo, I do have a 110mm ED and, while imperfect, the latter does go deep enough to identify Pluto. It is simply no contest in favor of the 10", except on the largest objects where the higher transmission of the refractor combines with a very wide field and large exit pupil. Unfortunately, there are perhaps 50 such targets...compared to thousands where the 10" is the better scope. In any event this is the refractor forum, the OP was talking about small differences in refractor aperture, and comparison to 10" reflectors is probably best left out of the discussion. Unfortunately the refractor forum has a tendency to push the bounds of reality and physics, so I push back. Yes, yes it does. And so in its wisdom CN created a special place where refractor owners could run wild with their illusions, causing no harm to the general public. Edited by gnowellsct, 06 July 2017 - 06:32 AM. I thought I wanted a 140 class APO. The image and fantasy of it has been kicking around in my mind for most of the year. They're such nice looking telescopes - what a telescope is supposed to look like. At a major star party a few weeks ago, I found a beautiful 140 - a very well-known top quality model mounted to atop a big G11 and I asked the owner if he would please show me M15 in it. He was proud to do so and we looked. He raved and I was silent. I thanked him and walked back to my premium 16" Dob. Looked at M15 in the 16 and raved to myself saying I'm so glad I have the 16. For the same amount of setup and money, what a difference! I agree that globulars look best at larger apertures. I like my 10" Dob for those. However, my 140 APO does a very good job on the brighter ones like M15. Perhaps the one you looked thru was not as "top quality" as was assumed. Or perhaps you require greater magnification in order to get any "wow" out of objects. From my "dark" site, M15 barely resolves with a 4" refractor. It starts resolving nicely with a 120mm. Now I have a 180mm Maksutov. "180mm ought to be enough for anybody." YOU MEAN YOU WANT A BIG BALL OF BUZZING STARS COMING AT YOUR EYEBALL LIKE A NUCLEAR TORPEDO? Well, it's one way of doing things. But my favorite globs are softer in rich star fields, like M56 and M71, or NGC 6712. Refractors show these in a very nice way. Low power views are an acquired taste. I don't know, the refractor forum also seems to be a place where people go to tell others their scopes are too small - nearly worthless - or to tell us all about how great their large instrument is. I keep reading it on a very repetitive basis. Yet there is no mass migration out of refractors, no rush of TEC160's and AP Travelers hitting the classifieds as people realize they've been duped! Any delusions one has about refractors dissipate quickly when you fork over the money for one. Of course you're thinking about how much the money could buy in a Newt, or a Mak, or a helicopter skiing vacation, new kitchen, mortgage payments, etc. I set up and take down next to friends loading behemoths into their vans all the time. I'm often happy to show up with a 120mm refractor, or even 100mm, just a different choice. Edited by Scott99, 06 July 2017 - 06:54 PM. If one looks at M15 in a perfect 140 mm and then walks over to a decent 16 inch, I think the difference is quite stunning. There's a factor of almost 3 in resolution and about 8 in terms of light gathering, that's more than 2 magnitudes.. These are small object, they don't need a 3 degree TFoV to frame them. One degree is plenty. If you are viewing them in a large aperture scope and are disappointed in the well resolved view and want something softer, defocus until it suits your taste. Realistically, the stars in even the brightest globulars in a large aperture scope are quite faint, the brightest star in M13 is magnitude 11.95. In terms of seeing the actual nature of a golubular, that larger scope will show more. "Unfortunately the refractor forum has a tendency to push the bounds of reality and physics, so I push back." I am one who enjoys the views in both refractors and reflectors, this forum is for the discussion of refractors with hopefully a realistic perspective.. I think it was Scott Beith who invented the term SRF to jokingly refer to himself and others of the ilk. For those who don't know what SRF stands for, it's Slobbering Refractor Freak.. I am not a SRF nor is Red.. This thread is about how much aperture is necessary to make a difference. Certainly a 20% increase is significant.. Larger differences in apertures make larger differences at the eyepiece. There can be significant increases in the hassle factor with increases in apertures.. I enjoy the low power views refractors provide, including the 80mm that serves as a finder. I have even managed to detect NGC 5053 with it from a dark site. However, the views of globulars through the ST-80 at low power don't compare to those through increasingly larger scopes (including refractors...the topic of the thread.) Keep in mind that I spent time last year upping the power in the ST-80 and a cheap 70mm refractor just to determine how many globulars were resolvable (to a limited degree of course) in small refractors. I still examine them at times in an 80ED, 110ED etc. to appreciate the differences in the views. My favorite globulars are rich ones that resolve into many faint stars like sand on a black cloth. This is far easier to accomplish as the aperture increases. There also many other types of globular, and most of them won't resolve appreciably in small apertures. NGC 5053 mentioned above is an interesting one as it takes large aperture to resolve this very sparse, gossamer haze. Smaller aperture can't reveal these sort of things, so which gets back to the question posed by the thread question "How much increase in aperture to see a difference?" I could see a noticeable difference going from 70 to 80mm. And when a smaller aperture is being used in town it is at an even greater disadvantage because it has less magnitude depth to surrender to light pollution. So...it doesn't matter whether the refractor is "top quality" or not as you hypothesized. It is a 5.5" refractor. It is limited by its aperture in the depth to which it will resolve even a globular cluster like M15. A 16" is going to show it far better in with well over a magnitude more stars resolved even at the same magnification. There is an erroneous assumption in the refractor forum that if one doesn't lavish unrealistic amounts of praise and hyperbole on the performance of refractors, then one is anti-refractor. In reality, one can recognize both strengths and weaknesses in various scope types. I don't see that it benefits anyone to remain silent when the refractor performance claims lose contact with reality. I tried again a few weekends ago to get a good look through a high end refractor. Never did get the opportunity, it was the same old story I've seen every time there are higher end refractors around. The owner was always doing something with the alignment, setting up for imaging, etc. Observing...not so much. I don't hang around waiting for a look. I'll catch a look through a premium refractor one of these days...maybe it will blow my mind. You know, I hear how great these scopes are, yet folks don't offer views through them to other amateurs much. And they don't bring them out to more casual observing from what I have seen over the decades. Perhaps this is a way to maintain the aura/mystique/mythology associated with them. Amusingly, I'm the one who brings out a 110ED for club events sometimes...haven't seen any other refractors at them so far. As for mass migration, I wouldn't expect it as premium refractors are primarily imaging scopes. Nevertheless, they seem to make the rounds on the used market with far greater frequency than big Dobs so folks don't seem to have trouble parting with them. Maybe you're going to the wrong star parties. 9" Clark in front, 8" D&G in back. There is no question that astrophotography is much more "fiddly" than visual observing, so, in as much as refractors are popular with imagers, there is going to be more setup and calibration time. It's not, however, anything inherent in the design of a high end refractor. As far as owners being willing to share the views at star parties... I haven't experienced what you are describing. High end refractors certainly aren't as common as other designs, but I put that down primarily to cost. 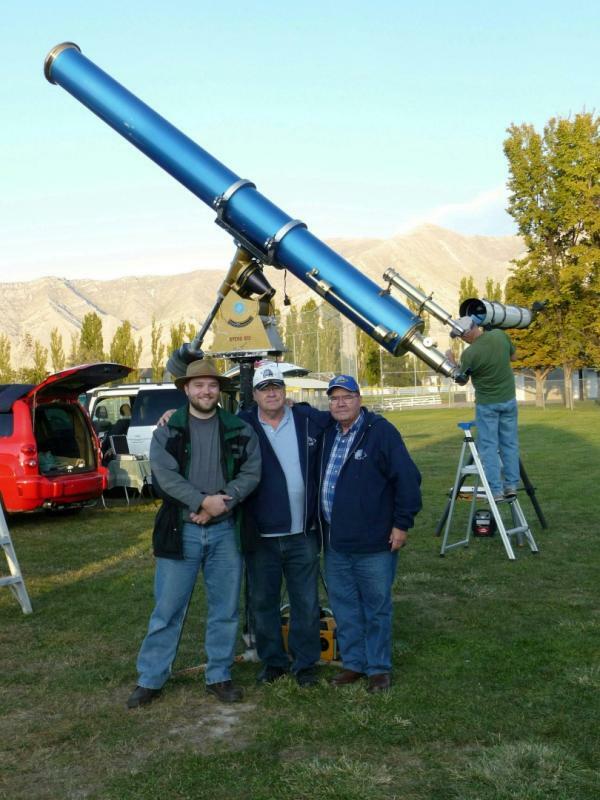 $8,000 optical tubes of any design are fairly rare at star parties. At least at the club events I usually attend. As for the mass migrations... I get the impression that refractor owners are more likely than most to be in search of the "perfect" telescope. Since such a beast doesn't and can't exist, they flip their scopes more often than owners of SCT's or Newts. I can't prove this theory, but it seems to explain a lot of behavior on this forum and in the classifieds. Refractornowners seem to worry more than most people. And I include myself in this group though I own and use both refractors and a largish cat.